Reading the catalogue description of this I thought that it would be like a "Cardall" image, an idealised bit of Paddywhackery but when I looked at the image my reaction was WOW! This is so different, almost Eastern European in its style and there are so many things to wonder at! Will we ever know where it was taken? Probably not very good at reversing? 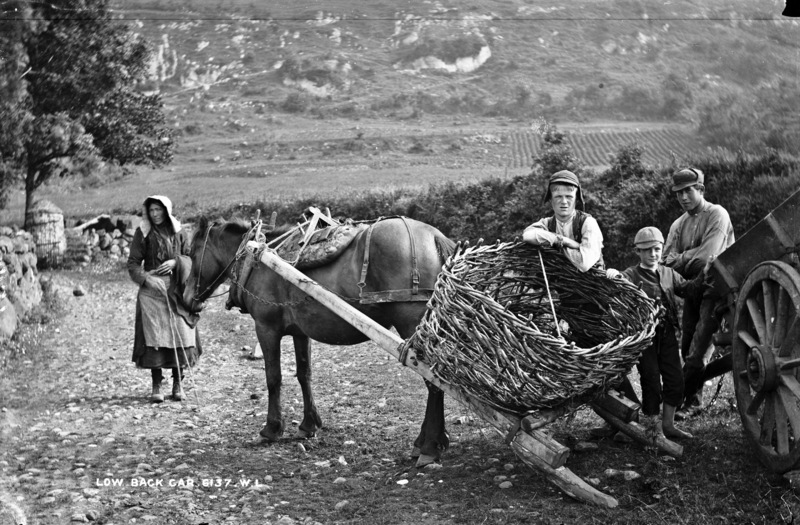 It reminds me of West Clare, and the creel for seaweed, which was used as fertilizer. This is a stunning image for its time. There is special beauty in a hard life. [https://www.flickr.com/photos/abandonedrailsireland] Could be a railway, but I think it is more likely a river. We see a recent flat bridge crossing left-right just above the horse's ears, consistent with a railway, but beyond it is a much older and ruined arched bridge, with two arches standing. That ruined bridge is too old to have been built for the railways. it could be in the north for there is an Ulster pillar to the left of the photograph unless they are found elsewhere in the island. I would have thought that it's a bit rocky for Glenshesk. Marvelous basket, creel. I can't imagine building such a thing, having made one or two small simple baskets in my day. Could the wheelless car be a "slipe" or sliding cart? The word is used in Scots and Ulster English. I'd put the OSI link only geohive's too much trouble. Well done The [https://www.flickr.com/photos/[email protected]]! [https://www.flickr.com/photos/shero6820] I would call it a slipe. [https://www.flickr.com/photos/[email protected]] I've been out and only seen the second photo now. Good for you. I was up the Garron Road for the hillclimb only a couple of months ago. Good Lemur - have a grape. [https://www.flickr.com/photos/abandonedrailsireland] [https://www.flickr.com/photos/iliaal] [https://www.flickr.com/photos/beachcomberaustralia] [https://www.flickr.com/photos/cassidyphotography] [https://www.flickr.com/photos/gnmcauley] [https://www.flickr.com/photos/[email protected]] [https://www.flickr.com/photos/melystu] [https://www.flickr.com/photos/shero6820] [https://www.flickr.com/photos/[email protected]] [https://www.flickr.com/photos/[email protected]] [https://www.flickr.com/photos/gnmcauley] Real Photo Detective work today, thanks for all your effort and a special mention for [https://www.flickr.com/photos/[email protected]] I did not think we would identify the location!!! Brilliant. [http://www.flickr.com/photos/[email protected]/] In the reverse view photo there is a Dog under the Slipe. [https://www.flickr.com/photos/[email protected]] I did say, "I wonder why Robin hasn't got it already", but I'm surprised you could hear me. [https://www.flickr.com/photos/[email protected]/] The bridge in the second photo was one of those ‘I should know that place’ moments. On the 6" linked, I also see that the farm is one of one farms in Ardclinis in the 1830s. The 1911 census records 3 houses with a total of 8 residents, none of them younger than 34. 1901 shows 16 residents in 5 houses. (House is perhaps a generous term, they are all 2 room buildings). It includes some young boys, the Kellys, but they are too young. By the time they are as old as in the picture, they should be in the 1911 census, and they aren't So we could be back nearer 1885, and the boys are the O'Neills, perhaps Charles, James and Edward.